Following the screening by Deimantas Narkevičius on 15 November, CAST is presenting one of his most acclaimed films, The Role of a Lifetime (2003) as a single screen video installation. Employing archival footage, voice-overs, interviews, re-enactments and found photographs, Narkevičius’s films and videos reinterpret historical events by playing with different narrative structures, such as memoir, documentary and drama. 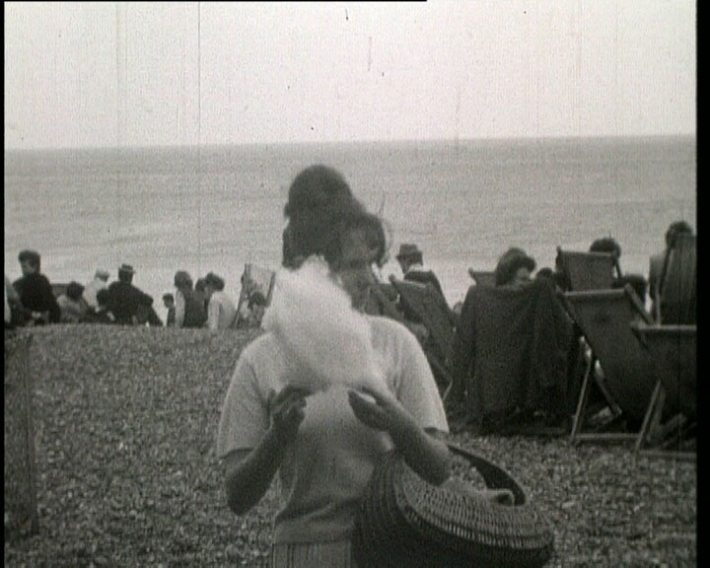 The Role of a Lifetime comprises three distinct elements: a sixteen-minute montage of amateur footage from the early 1960s, showing scenes of everyday life in Brighton; panning shots of graphite drawings of landscapes; and an audio element of a male voice discussing film as a manipulative form of representation. Five minutes into the film the speaker is revealed to be the British filmmaker Peter Watkins, best known for his innovative and politically charged documentaries. Watkins explains that he is being recorded in Gruto Parkas (Grutas Park), a theme park in Lithuania housing a collection of Soviet-era sculptures removed from the country’s public spaces. Apart from this sequence, in which Watkins’s voiceover is accompanied by drawings of the sculpture park covered in snow, the spoken text and on-screen images in the film do not coincide in an obvious fashion. Instead, the juxtaposition of voice and image remains enigmatic, stressing the ambiguous and constructed nature of all filmic narratives. The Role of a Lifetime was commissioned for St Peter’s Church in Brighton as part of Art and Sacred Places, a national initiative for which contemporary artists were invited to make new work in sacred spaces. Asked to respond to an unfamiliar context, Narkevičius based the work on amateur footage of Brighton shot in the 1960s, which he found in the South East Film and Video Archive located in the city. He juxtaposed this with material from two other sources: a series of landscape drawings, made by Lithuanian artist Mindaugas Lukošaitis, and the soundtrack, derived from interviews with Watkins, who lived in Lithuania for many years. We put images and sounds together, but we never discuss with the audience, with the people, what it means to do this. What effect is this having on society, on history, on our personal feelings, on the way we speak to each other? What effect is it having on the way we think about time, space, structure and process? See also Tate Shots: Deimantas Narkevičius: From one political formation to another, which includes discussion of The Role of a Lifetime.